STOP PRESS May 2013: GWR lower quadrant arms in preparation - we have created our own collection of REAL signal arms to ensure ultimate accuracy: just waiting now on a pair of 1933-51 arms! Register now for e-mail notification when available. Office Address: Chiltern Modelling Services, 7 Portobello Close, Chesham, Bucks. HP5 2PL, UK. I have produced a set of waterslide transfers to customise your Dapol BR/LMS upper-quadrant signal arms. 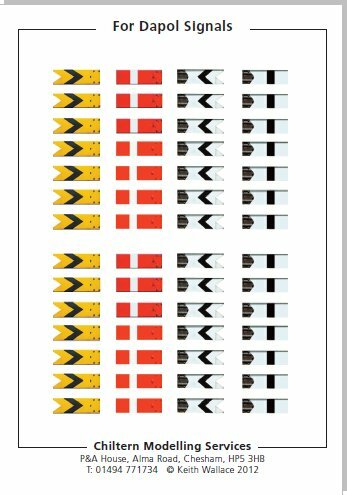 These are invaluable for anyone wishing to improve the look of their BR/LMS signal, as the colours and spacing are taken from prototype signals, and so feature the correct spacing and colours, as well as the bolt heads that secure the arm to the backing plate. A standard (unweathered) arms are provided in multiple, together with a selection of weathered arms. The Dapol arm needs to primed white (there is show through), and then gloss varnished (this allows the transfer to grip the surface). The transfer is then softened with a drop of water, and when loose, teased onto the arm with a cocktail stick or similar. Transfers for ONLY the front and back of the arm are included - it is assumed the spectacle plate will be left 'as is'. Buyers need to be aware that the Dapol arm is higher and thicker compared to the etched scale arms provided by MSE/Wizard or Scalelink, and the transfers take this into account, so they are NOT suitable for etched arms. Also be aware that the top of the arm has to be painted white and then touched up with Humbrol 174 (red - Home) or 24 (yellow - distant) to match the transfers (the width of the black and white bands differ significantly from the Dapol paint scheme). Payment via our secure shopping kart or PayPal - you can choose which you prefer once you have entered your details. Transfers will be posted as soon as I receive your payment. This item will be despatched within 3 working days from receipt of payment, and is postage free to UK and International addresses. Order now whilst you are thinking how difficult it might be to mask off an effective chevron on BOTH sides of the arm! Save yourself hours of cussing and swearing! 7 Portobello Close, Chesham, Bucks. HP5 2PL, UK.